Taste test: This bag was jam-packed with fresh, crisp, mostly unbroken chips. Several of the chips ranked among the largest I've ever seen, including one absolutely enormous one right near the top that was definitely the biggest ever. The chips did feel and taste extremely fresh, just as the bag said they would. 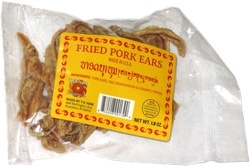 The flavor was excellent: very tasty, fairly spicy and moderately hot. The chips didn't have a noticeable jalapeno taste, but they were nonetheless quite good. 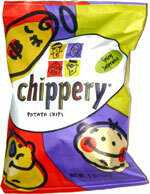 Upon seeing a bag like this, most people would ask whether they're any different than ordinary bagged potato chips. Having tried them, I can say that they indeed are. Smell test: Sort of a sweet smell, like cookies. Trivia: Two weird things: There are no ingredients listed on the bag. Second, they use a spelling for jalapeño that I've never seen before: "jalpeneo"
This snack was discovered by Jeremy at Marche Movenpick, Prudential Center, Boston. Review published .